In Part 1 of this two-part series, I proved the media’s financial gurus are wrong when they claim that it takes years to build cash value in a whole life insurance policy. In this second part of the series, I’ll show you why all the self-proclaimed experts miss the boat when they claim that whole life insurance policies are a rip-off because you build up all that cash value, then the insurance company keeps it when you die and only gives your heirs the death benefit. It doesn’t have to be that way, my friend! This is a whole life insurance policy purchased on my life in 1992. The statement I’m showing you, issued 17 years later, makes some astounding revelations. First, note the date of this statement: January 31, 2009. What do you remember about the financial world around that time? It was a time of crisis, with the bursting of the real estate bubble and crashing of all markets. Many folks’ dreams of a comfortable retirement were crushed! This global financial crisis is considered by many economists to have been the worst financial crisis since the Great Depression. The one-year statement at the top of this page covered a year that was awful—one of the worst ever—for stock market and real estate investors. In fact, the S&P 500 was down 40% during that period. What Happens to Bank On Yourself-Type Whole Life Insurance Policies When the Stock Market Is Plunging? How do Bank On Yourself-type life insurance policies fare during down markets? Take a look for yourself. Even with all the turbulence in the financial world, nobody who owned a whole life insurance policy saw their policy take a hit. For example, none of my whole life insurance policies, including this one, lost even a penny of principal or growth. In fact, in this case, my cash value—my equity in the plan—actually increased by $12,205 that year. My equity grew about two-and-one-half times more than the $4,975 premium I paid. I know plenty of people who would have given their right arm for just a fraction of that growth. I still haven’t addressed the “insurance-company-keeps-my-cash-value-when-I-die” complaint, because that’s only one of the points this policy statement—a very typical statement, by the way—demonstrates. Many financial advisors seem to know only about whole life insurance policies where the death benefit stays level. Most self-declared financial authorities (including Dave Ramsey and Suze Orman, by the way), only refer to whole life policies where the death benefit stays level for the life of the policy. They think a death benefit is a death benefit is a death benefit. Your own eyes will tell you they’re wrong! With a dividend-paying whole life policy, dividends can be left in the policy to purchase additional coverage, known as paid-up additions (PUAs). They’re called “paid-up” because you pay for them just one time—in this case, with the policy dividend you were credited. Thus, PUAs boost your death benefit, and they also have the effect of making your money in the plan grow in the most efficient way possible. I left my $3,866.10 in dividends I received in 2009 (that down year) in my policy—exactly the same as I did with all the other dividends I’ve received before or since. I just leave them in my policy, and that has really cranked up my death benefit—and my cash value, too. When this whole life insurance policy was issued back in January 1992, the death benefit was $250,000. That’s the Basic Insurance Amount I highlighted on the left in the statement at the top of this page. But by the time this annual statement was issued, the death benefit had grown to almost $400,000 dollars—$390,588, to be exact. That’s the Total Death Benefit I highlighted. Over those seventeen years, the death benefit increased by more than 56%, nicely keeping up with the inflation we experienced during that same time period. Would the term life insurance policies Dave and Suze are constantly hawking have kept up with inflation? Not at all! So what happens to the cash value in a Bank On Yourself-type whole life insurance policy over time? Bank On Yourself Authorized Advisors typically recommend leaving your dividends in the policy to purchase those marvelous, hard-working paid up additions. As I stated in Part 1, paid-up additions purchase additional coverage in the most efficient way possible. And more coverage means more cash value, too. The above copy of my annual policy statement makes it crystal clear. 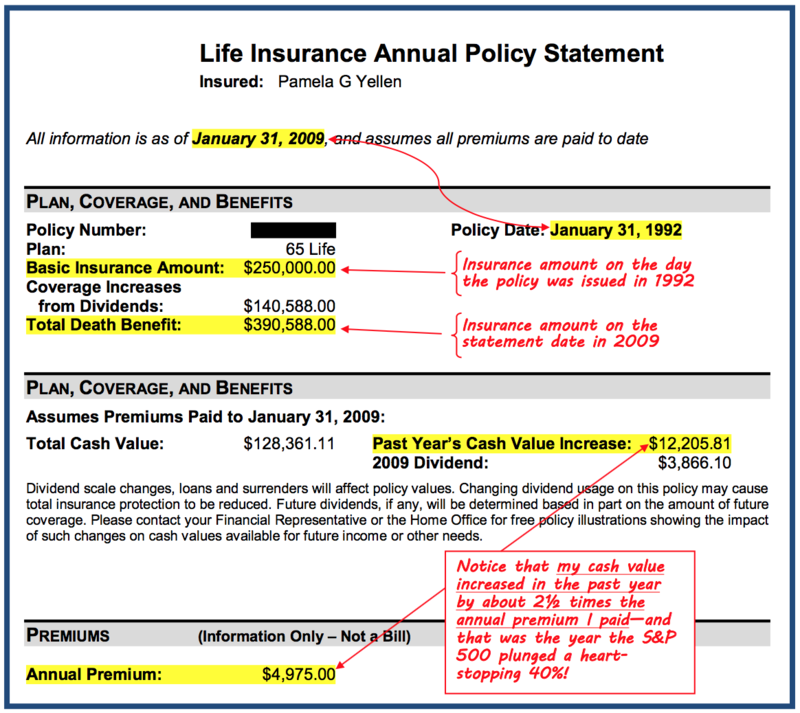 Not only has the death benefit increase by well over $140,000 over 17 years, but my cash value increased just in that year ending January 31, 2009, by $12,205. Compare that to the premium I paid! A $12,000 increase in cash value for just $4,975 in premium for the year—during a year that saw both the stock and real estate markets crash! So Does the Life Insurance Company Keep Your Cash Value While Paying Your Beneficiaries “Only” the Death Benefit When You Die? If I had died on or about January 31, 2009, the date this statement was issued, my beneficiaries would have received a death benefit of $390,588. You tell me: Does that mean the insurance company would be keeping my cash value and only paying my beneficiaries that basic $250,000 death benefit the policy started with? The fact is, the $390,588 death benefit they would have paid is more than the original death benefit of $250,000 plus my cash value of $128,361. It’s over $12,000 more! The so-called experts talk only about policies that don’t pay dividends. They don’t seem to understand the twin concepts of growing cash value and growing death benefit! This is just one more thing the experts don’t know about Bank On Yourself. 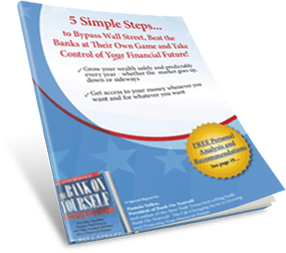 If you’re curious what else the experts don’t know, I’m happy to give you a free copy of my Special Report that reveals the exciting details about the 5 Simple Steps to Bypass Wall Street, Beat the Banks at Their Own Game and Take Control of Your Financial Future! In about 20 pages of easy reading, this report details all the valuable, safe wealth-building tips that run-of-the-mill, traditionally-trained financial advisors either don’t know or don’t want you to know. The report is free, and you can download it instantly to continue building your store of vital financial wisdom. And when you’re ready to take action—or to find out just how marvelous your financial future could be if you add the Bank On Yourself method to your financial plan—just request your FREE Analysis, which will be based on your individual financial situation and your specific dreams and goals. You’ll receive a referral to an Authorized Advisor (a life insurance agent with advanced training on this concept) who will prepare your free Analysis and share with you a Personalized Solution that can help you reach your financial goals much faster than you might imagine is possible. You have absolutely nothing to lose by asking for your free Analysis. But you could be missing out on a tremendous tax-advantaged safe wealth-building strategy—and letting a world of financial freedom slip through your fingers—if you procrastinate! Please take action now. If you missed Part 1 of What the Experts Don’t Know About Bank On Yourself, be sure to read it here. You’ll discover why so many financial planners must be wearing blinders when they claim it takes years to build up significant cash value in a properly-designed whole life insurance policy! how much money did you put into the policy besides the annual premium? This policy was started long before I found out about Bank On Yourself. I paid no additional money into the policy – other than the base premium of $4,975. The policy doesn’t allow me to do that, even if I wanted to. A Bank On Yourself policy is designed from the get-go to allow you to put additional premium in, which turbo-charges the growth of both your cash value AND death benefit. How many years did you hold this policy? Would it be possible to show one hypothetical example of a policy over time? Basically a table with all the information shown in the statement above, but for each year over the course of say 20 or 25 years. I understand that all policies are different but such a quantitative example would go a long way in people understanding the Bank on Yourself concept and what to potentially expect. You are correct; no two plans are the same. To find out the bottom-line results you could get with a Bank On Yourself plan, request a free Analysis and referral to a knowledgeable Bank On Yourself Authorized Advisor. Why use this type of Whole Life policy instead of an Equity Indexed Universal Life policy? No other type of life insurance policy comes with as many guarantees as whole life. The only element of a whole life policy that isn’t guaranteed is the dividend. Equity Indexed Universal Life has been over-rated and has caused problems, with more problems to come, I predict. Besides, the last thing most people need is more equities (and if they do want them, there are far more cost-effective ways to own them). What most people need is a solid base of savings that aren’t exposed to the risks and unpredictability of stocks and mutual funds.